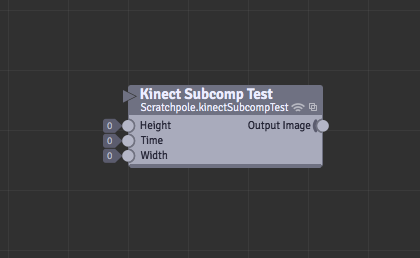 The width, height and time inputs are not in the order as they are in the subcomp file. This may be unrelated but I made a more complicated subcomp with the kinect creating a mask image and also outputting the rgb and depth images, when I run this into point grid/line grid and displace scene with image it looses sync, the rgb image is way behind the other images. (Edit: this seems to only happen when I increase the number of points in my grid to over 200 x 150 so it's probably just my GPU struggling to keep up). Had a fault when trying to upload the attached file initially as I'd moved it before uploading and then the website would not allow me to link it a second time. I think I've seen reports of the original bug previously but upon searching it returns pages and pages of links to the manual. I also find searching through the bug reports to be over laborious as they are split into sections and I'd need to search through every section. Yes, this is a bug. Thanks for reporting it. Could you create a separate bug report and attach the composition? I don't think it's related to this bug. We intentionally made manual sections rank higher in search results than bug reports, since the manual is more helpful for people trying to learn Vuo. When you want to search only for bug reports, you can use the "Filter by content type" link in the sidebar.